Alternate builds are MOCs that can be created from the parts in a single LEGO set. There are thousands of alternate builds on Rebrickable! To see what alternate builds are possible for a specific set, go to it's details page and click the Alternates tab to see if there are any fan-submitted designs. You might have quite a number of LEGO sets and want to see what you can build with all of those parts in your colelction. This is why we created Rebrickable in the first place! 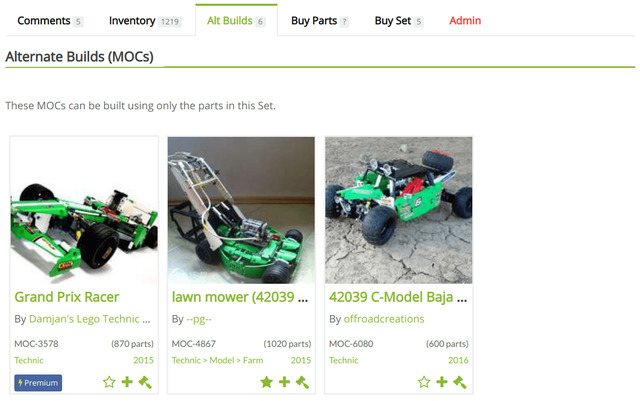 Click the Build menu and click the 'Find Sets you can Build' button.